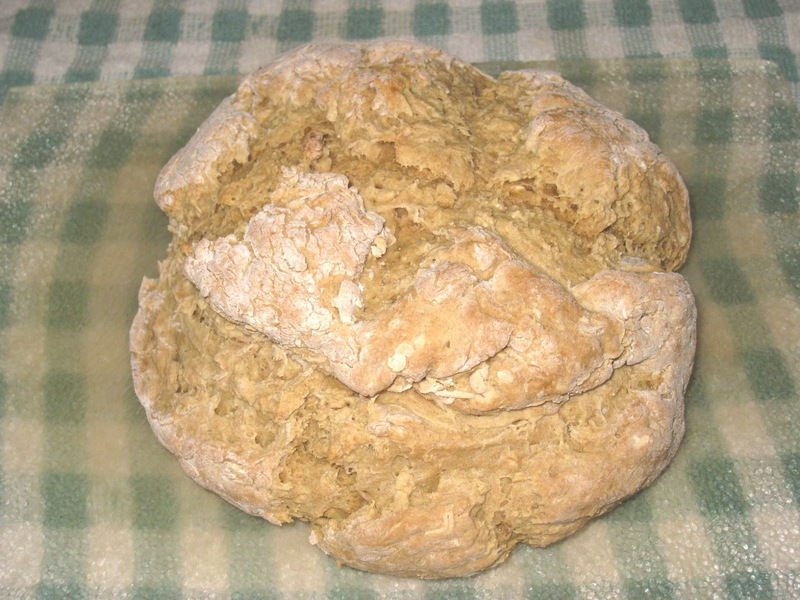 After I made my first Irish soda bread for St. Patrick's Day a couple of years ago I started looking for a more healthful, savory version. I really liked the raisin-sweetened white flour version, but like most sweet treats it is meant to be enjoyed occasionally, as a treat. But because it was so easy to make and had such a wonderful bread-like consistency achieved without yeast or long risings, I wanted to see if I could find a savory version that contained whole wheat flour and no sugar. An internet search brought up a recipe from Claire Robinson, who had (has?) a show on the food channel called "5 Ingredient Fix." Not counting salt and pepper and maybe a few other ingredients considered staples, the show features recipes that can be made from 5 or less ingredients. When I first started watching it I assumed it would involve opening a lot of boxes and cans a la Sandra Lee, but I was pleasantly surprised to find that the recipes contained fresh ingredients and involved actual cooking. And what she was cooking looked good. I was not particularly tempted to try any of them, but when I went searching for a savory soda bread recipe that did not contain raisins and found this recipe I decided to give it a try, based on what I had seen from her show. And I was not disappointed. It was delicious. And ridiculously easy. It has become one of my staple bread recipes. It is the perfect recipe for those times when I have neither the time nor the inclination to play with yeast but I want bread. And it holds up beautifully to sandwiches and toasting. When I am making it just for myself I will halve the recipe and I have enough bread for about a week. From the thought of bread to a lovely loaf cooling on your counter in less than an hour, this is the one that you want. In a large bowl, whisk together the flours, baking soda, oats and salt. Pour in most of the buttermilk and mix well, adding more buttermilk, if needed, to form a soft dough. Turn out onto a floured surface and lightly knead into a shapeable dough. Avoid overworking it. Shape the dough into a round disk shaped loaf and cut a deep "X" in the top with a sharp knife. Put the dough on a parchment-lined baking sheet and bake for 7 minutes at 425 degrees F. Lower the oven temperature to 375 degrees F. and bake another 20 to 25 minutes. Remove the bread from the oven to a cutting board. Cool slightly before cutting and enjoy warm! hey, it's nicole I lost your email, how do i email you? I looked on your blog but i can't find anything. Hi, Nicole. I've been thinking about you lately and wondering how you have been doing. I have updated my profile so there is now an option to contact me via email there [dejamo.at.cookingwithoutanet.com]. I stumbled on your blog (trying to remember how-- think it was a Madjur Jaffrey recipe we had a mutual fondness for) and then kept reading. I think I will try this bread this very night, because I am lazy and love homemade bread and have buttermilk that needs using up: a trifecta! Thanks from a new reader. 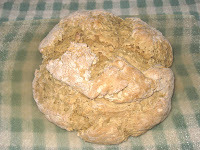 I hope you like the bread - it is still a staple of mine and a great way to use up buttermilk. Thanks for stopping by my blog! I finally got around to writing about my experience with the bread... basically boils down to: the bread does not taste wildly different from the soda bread I've been making for a long time, but I like your blog and plan to continue to read it. :) And I put you on my very short blogroll. Link here: http://www.eatingisimportant.com/home/feb-11-12-food-diary-eating-things-rarely-found-in-montana Thanks! Thanks for the link in your post and for putting me on your blogroll. I visited your blog after you left your first comment and enjoyed what I read, and will definitely be back to read more. Healthier is definitely worth something! (Also, as I said, using up buttermilk is a big plus.) But ultimately I care more about writing than recipes. Recipes are a dime a dozen, but I enjoy people's individual voices when they write about food. Actually (if I ever have any readers!) I would love to see guest "food diaries." Guest food diaries would be interesting, Eve. I kind of got mesmerized reading yours. And I am so pleased that you like my writing. Most of the folks who land on my blog came because they googled a specific recipe and not to see what I have written, so it is nice to get that feedback! If you would like to stay in touch, you can email me directly at dejamo@cookingwithoutanet.com.